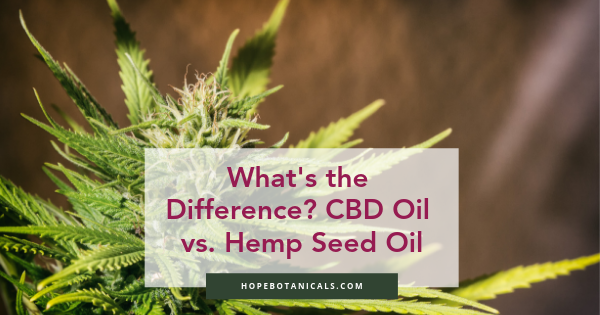 There is a lot of confusion about the differences between hemp oil vs. hemp seed oil, CBD oil, or hemp extract. Most of this confusion stems from the fact that hemp and marijuana plants are from the same Genus (or category) called Cannabis. People grow hemp for incorporation into other products. These products range from clothing to paper to makeup to cereal. Hemp is really a raw material. Think of it like other resources such as cotton and wood. Using hemp as a raw material was common prior to early last century. People used hemp for paper, for clothing, and for rope. Hemp seed oil is most often sourced from the Cannabis Sativa plant seed, also known as Industrial Hemp. Hemp seed oil production is regulated, and is tested for THC and CBD levels. However, hemp seed oil contains neither of those cannabinoids. Tests have shown that there are no cannabinoids present in the seeds of the hemp plant. So just some quick nutrition information! Hemp seed oil contains a fatty acid profile of 4:1. For most people, an omega-6 to omega-3 ratio of 4:1 is ideal–that’s 4 omega-6s for every 1 omega-3. Anti-aging experts suggest even smaller ratios, maintaining a 1:1 ratio or higher in favor of omega-3s. 4. The average American eats a ratio of anywhere from 12:1 to 25:1 omega-6 to omega-3. Not good. So Hemp seed oil is a good option for an oil with a good fatty acid profile. Cannabis oil is commonly from the marijuana plant but can vary depending on the manufacturer as Cannabis is also the botanical name of the Industrial Hemp plant. Cannabis oil from the Marijuana strain is extracted from the Marijuana plant. It contains high levels of THC and lower levels of CBD Oil. Cannabis oil from the Marijuana plant is illegal in most states. People use it for medicinal purposes and as a recreational drug. Cannabis oil production is not regulated. Hope Botanicals sells THC free products and well as one product that contains the federal allowable limit of THC at 0.3% or less. Q: Is Hemp seed oil the same as Hemp Extract/CBD Oil/Hemp Oil or medicinal cannabis oil? A: No, Hemp seed oil and CBD oil both are made from the same plant though. Hemp seed oil is beneficial containing a lot of antioxidants and omega-3 and omega-6 fatty acids. Hemp seed oil is pressed from the seeds of the hemp plant. This means it contains little to no CBD or THC. Hemp seed oil is often sold in 16oz bottles to 1 gallon jugs. Q: Will CBD oil make me fail a drug test? A: Depends. A lot of products contain a small amount of THC (usually the federal allowable amount of 0.3% or less) and if you use this, you will fail a drug test. If a drug test is a concern, you’ll want to find a product that contains 0 THC and says so on the label. If it doesn’t say “0 THC” on the label, it likely contains THC. Labs should be available on any product you purchase. Another option is to purchase a CBD isolate which means all other cannabinoids and THC have been removed from the oil in a lab. Hope Botanicals carries mostly 0 THC products, CBD isolate (called Hope Rx Clear) and one product, Super Full Spectrum Tincture, which contains 0.3% THC or less (0.3% is the federal allowable amount of THC). We use Hemp Seed Oil as the carrier oil for all our tinctures as we believe there is a natural occurring synergy between Hemp Seed Oil and CBD oil. Q: How do I understand the label? A. To delve further into the names for CBD oil, you will see labels that say “Full Spectrum” and “Broad Spectrum”. Full spectrum generally indicates the oil contains some THC, because full spectrum oil is mostly known as containing multiple cannabinoids, including THC. But with the advent of new extraction technology, labs can now extract the THC and leave behind multiple cannabinoids. So, to see a label that says “Full Spectrum with 0 THC” is not uncommon. Broad Spectrum has generally been the term for oil that contains CBD with no THC, with slight amounts of other cannabinoids. Once again, new technology is enabling labs to extract the THC and leave behind other cannabinoids. To emphasize the point, if you’re looking for a CBD product that contains 0 THC, look for “0 THC” on the label. Hope Botanicals uses the terms CBD, Phytocannabinoid-rich Hemp Oil, Full Spectrum and Super Full Spectrum. You can always contact us for more information on products. We know it can be confusing and we want to help you figure out which product is best for you, your horse and your pets.